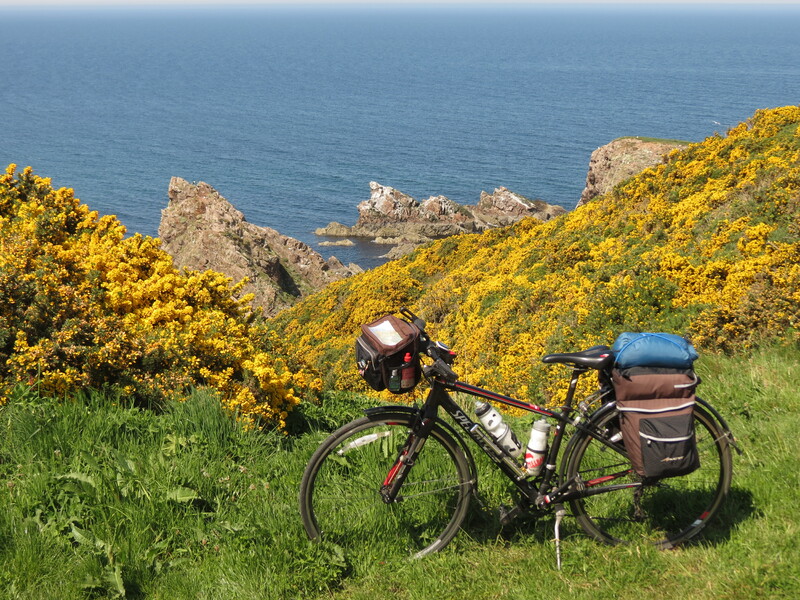 It’s easy to write about all the good stuff when we’re cycle touring. The fabulous scenery, the interesting people we meet, the fun adventures we have. 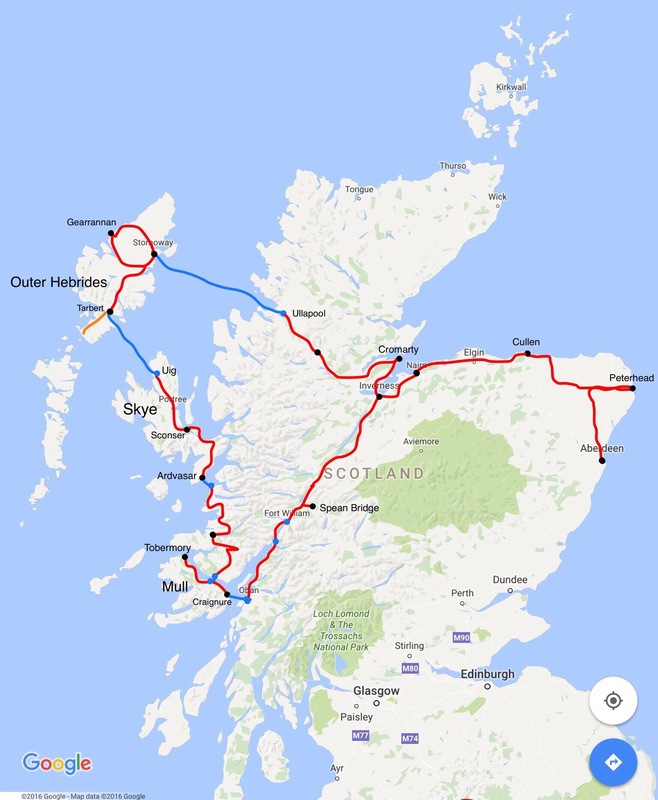 But my friends always tell me that they most like hearing about “how it really is.” So in the spirit of truth in reporting for our cycling tour of Scotland, here you go. Amazing scenery. I just have to say it one more time. We had outstanding weather. Scotland is known for its changeable weather, as well as the cold and rain. In 22 days, we had only one really rainy day, combined with horrific headwinds. While the temperature never did reach 70, we had 8 days of sunshine, 3 of partial sun, 7 cloudy and 3 with a few showers. Quite the record. 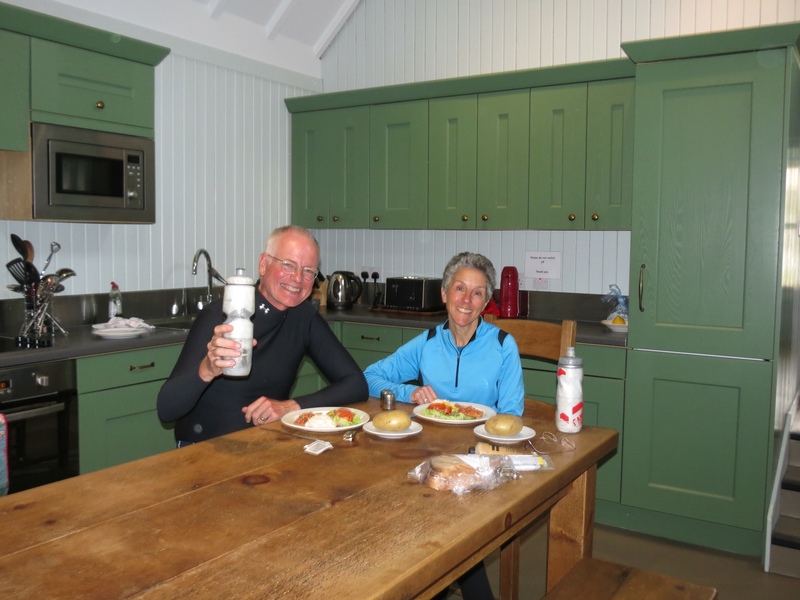 When cycle touring, it is impossible to consume as many calories as you expend. So the sky is the limit on food consumption, and all manner of treats are allowed. In the case of Scotland, my local favorites included McVities chocolate biscuits, scones (complete with jam and clotted cream) and cider on tap. The weather wasn’t always conducive to ice cream, but it’s a universal indulgence. 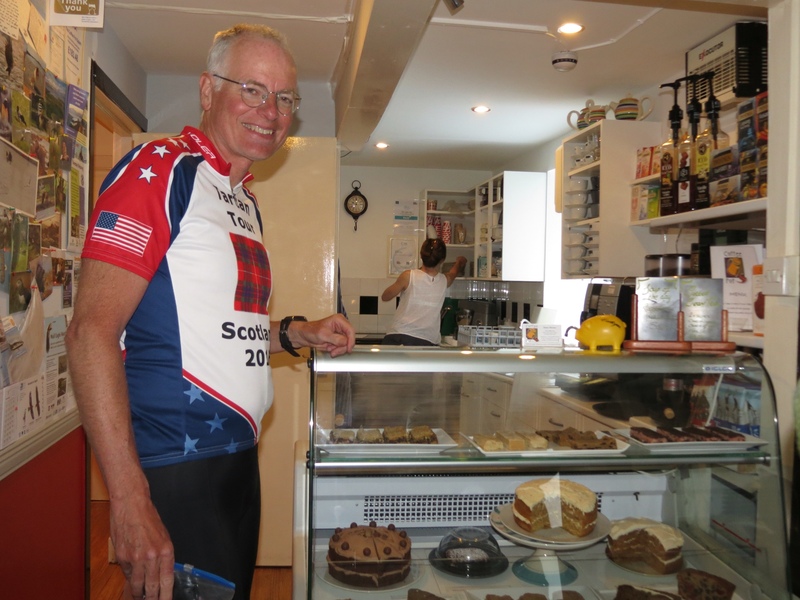 Despite the treats, one always loses weight when cycle touring. Even better, inches come off and muscles are toned. There’s nothing like coming home and finding those tight clothes fit so easily. Salmon. Lots of it. It was on the menu everywhere. What more can I say? We always carry an abundance of inner tubes (8 between us) and one extra tire. Normally we go through a good number of those tubes and the tire as well. 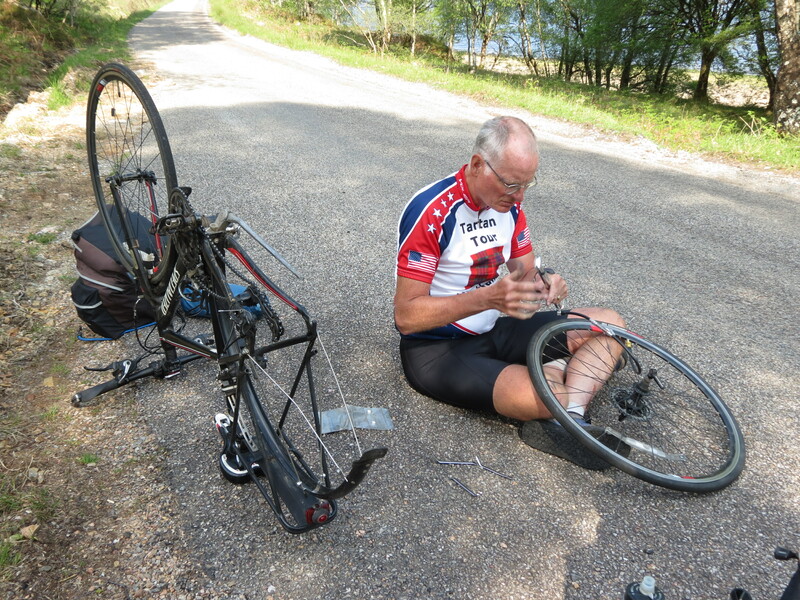 On this trip, Rich didn’t have a single flat – clearly a record for him! I managed two flats, primarily due to rocky trails. In the US, we have more trouble due to the retread tires on trucks. The shoulders are littered with metal shards left behind when the tires blow. We saw no such debris in Scotland. (Of course, there were no shoulders either… see below). In the US, the cyclist’s most dreaded road surface is one that has recently been “chip sealed.” It’s the cheap way out. Spreading the road with goo and throwing down crushed rock to prolong the life of the road surface. Sure, if you’re in a car you just roll over it. If you’re on a bicycle, it is a nightmare of uneven rocks that take at least a couple miles per hour off your speed. 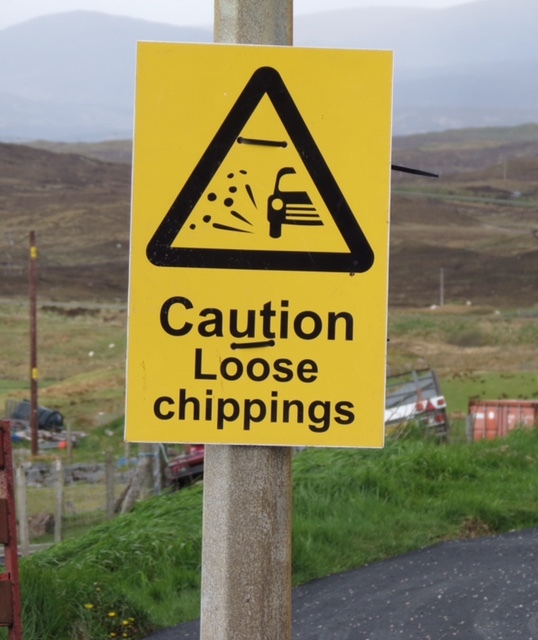 We were dismayed to learn that Scotland has learned about chip seal. They just call it by a different name. When we scout out roads for cycling, we pay particular attention to the shoulders. We look for paved shoulders that are wide enough for safe cycling outside the range of traffic. Forget that in Scotland. There is no such thing as a shoulder. There are few markings on the road period. Since many of them are only one lane wide, why bother? 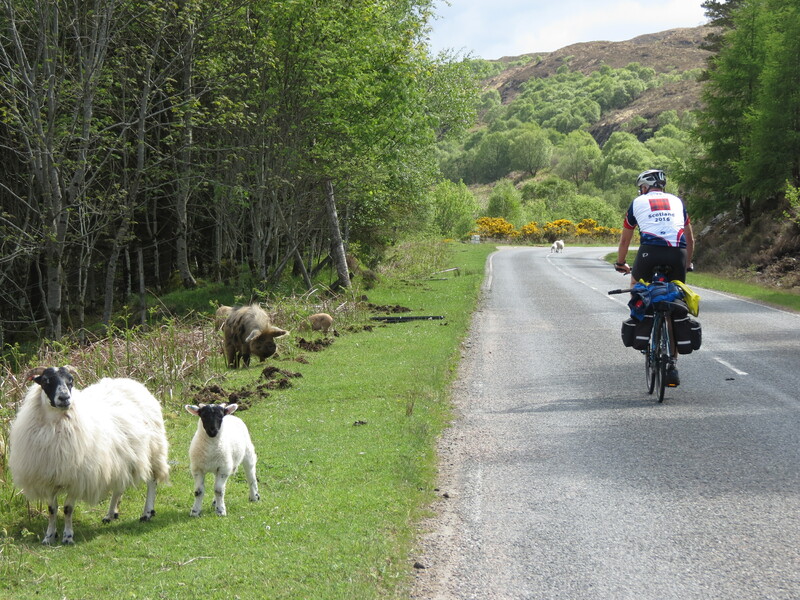 Fortunately, traffic is often light, and sometimes confined to just the local sheep. 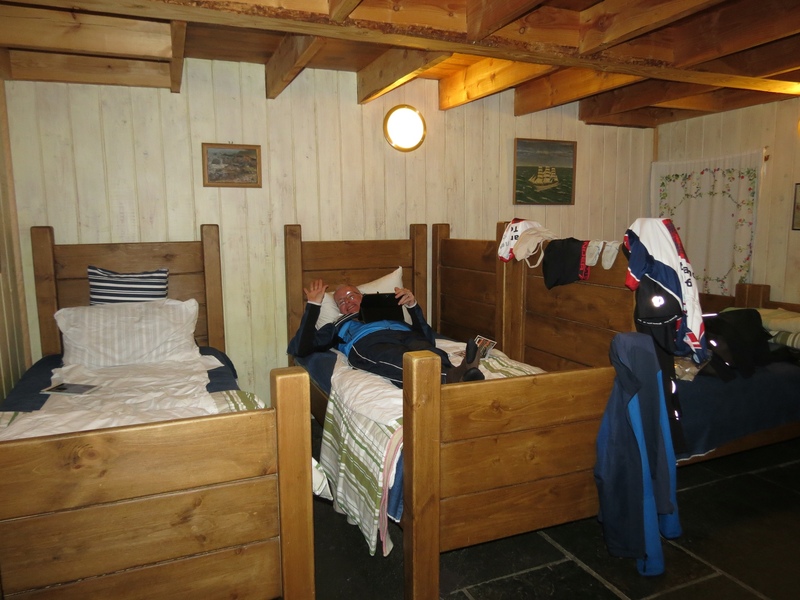 Finding cheap lodgings in Scotland was more of a challenge. There is no such thing as a roadside motel. The closest approximation was a guesthouse. It was obvious that some we stayed in were more like boarding houses. While the place was full, there was no one else at breakfast. The cooking tended to be blasé, the carpet was worn, and heat only came on for limited periods in the evenings. And just like cheap motels, electrical outlets were scarce. It’s one of cycling’s facts of life. I don’t know why, but hour after hour, day after day of cycling means a constantly drippy nose. Perhaps it’s the wind. Maybe it’s the exercise. For whatever reason, a runny nose is a signature symptom of spending days in the saddle. That’s life, live with it. Some of us have more sanitary ways of handing this nose issue. Mine is a kleenex, tucked into my handlebar bag. But not Rich. He has perfected the art of expressing his snot into the air as he rides. All well and good for him. Not so great for the cyclist behind him. Believe me, riding in the Snot Stream is no picnic. Especially when there is a head wind. If he’s feeling extremely magnanimous, he might invite me to ride in the “snot-free zone.” In that case, it doesn’t take more than 2 seconds for me to increase my cadence and fly past him to cycle in front. Traveling light is of utmost importance when cycle touring. That means the “wear one, wash one” concept of clothing is followed. When we cycle in hot climates, we constantly hand wash our cycling clothes every other night. 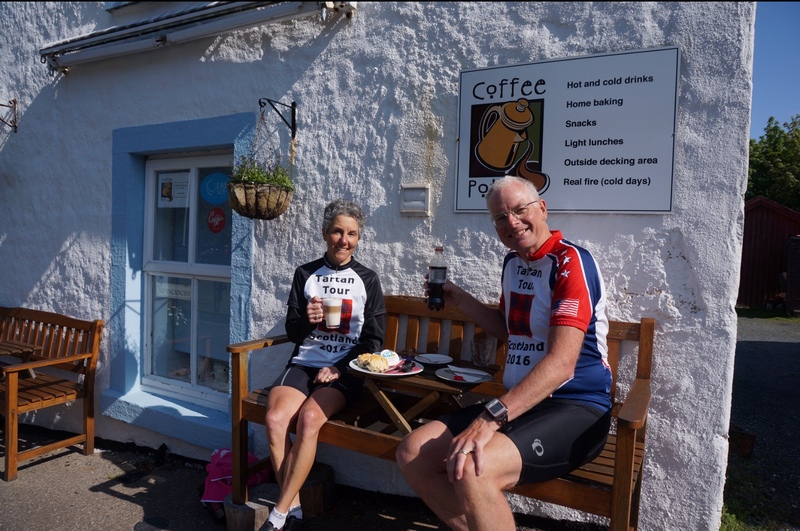 With the cold weather in Scotland, we could easily convince ourselves that we didn’t sweat as much and could wear our cycling duds more days between washings. It sure made life easier. I’m not sure if those around us would agree. For the most part, we manage to work together to plan our itinerary. But there are those moments when we don’t see eye-to-eye. 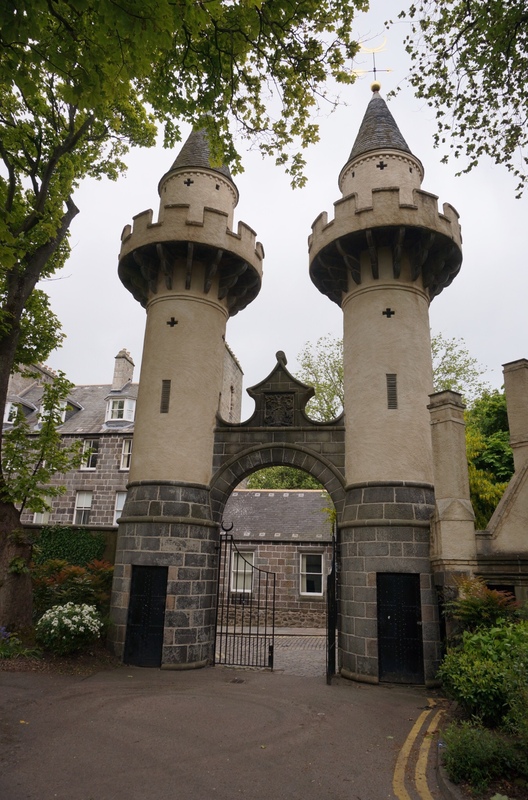 Take our final trip to see Fraser Castle when we got mired in traffic. I’m of the “never give up” camp. Rich is in the “let’s be practical” corner. We attempted to settle our differences on an isolated patch of roadside pavement. Let’s just say it was a good thing the traffic was zooming by. It wasn’t a quiet conversation. 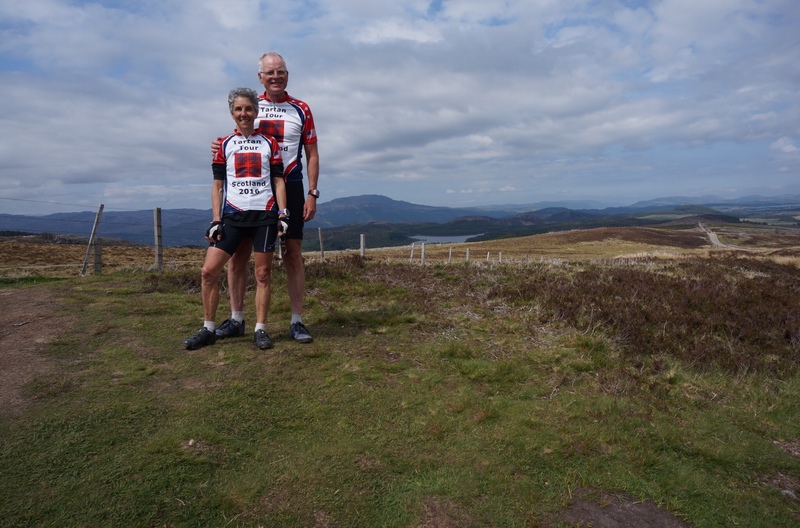 Just like blog posts, the bad and ugly bits easily fade into the background in our cycling trip memories. It’s the good that stays with us, and spurs us on to the next trip. No doubt that will be the case with this one. Stay tuned for our next adventure. There is no point in going to a foreign country if you can't adapt to local ways. Sure, it may mean doing without some of favorite foods, the comforts of home and familiar customs. But the fun is in learning about other cultures, trying new things and living life differently. Bike tours included. Many will recall last year's tour in which several days were spent “in search of Chardonnay.” In fact, it has since defined Rich's wine preference. However, since setting foot in Scotland we have exchanged our wine glasses for pints of cider. On tap is preferred. Bottled works. Nothing tastes better after a long day of cycling. Not even Chardonnay. Little roadside motels and campgrounds have been our staple for accommodations in the US and Canada. In Scotland we have substituted guesthouses and hostels. Just like motels, guesthouses range widely in quality. For each tired guesthouse with well worn plaid carpeting, I can think of a cramped motel room to match. It's what you get when seeking cheap lodging. The hostels, however, have been a great find. Like camping, they have been some of our favorite locations. It has been well worth the more spartan and shared arrangements. There is no arguing the fact that cycle touring burns a lot of calories. And eventually our bodies crave energy-rich foods. Rich loves to tattle on my habit of buying KitKat bars on our first long tour. While such exist in Scotland, I have switched my allegiance to my favorite biscuit. 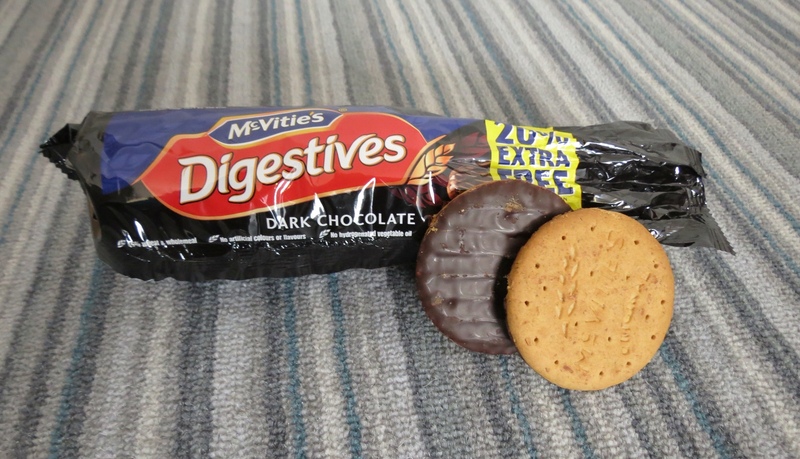 McVities Dark Chocolate Digestives. I'm on my third package already. The meager contents of our panniers are different for this trip. We left behind our after-cycling shorts and t-shirts in favor of pants and long sleeves. This one was less of a cultural difference than a practical one. It just doesn't get that hot here. Not even in the beginning of June. Finding dinner is often a matter of locating the nearest pub. 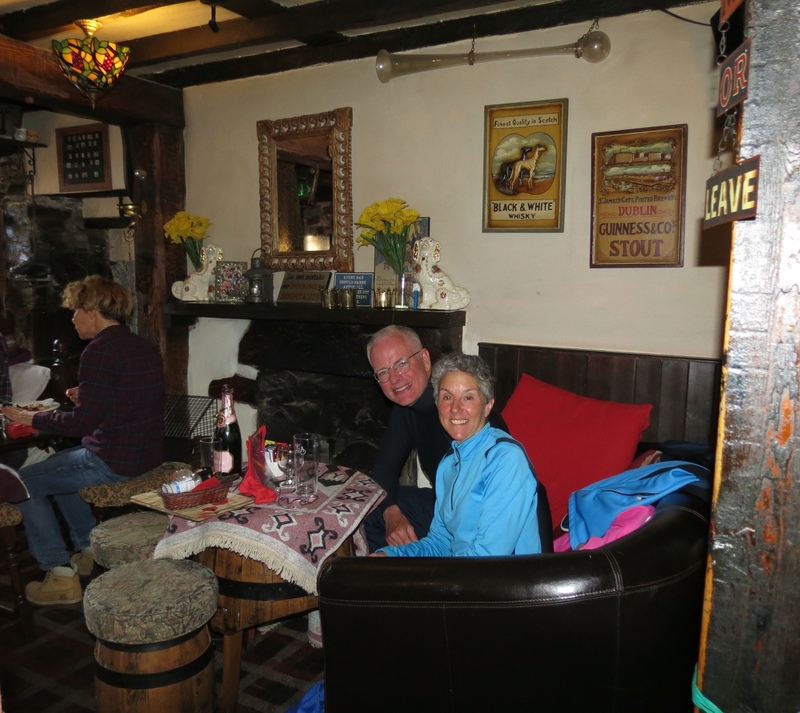 Although “pub grub” is heavier fare than I'm used to on cycling tours, it fills and warms at the same time. Somehow, it always goes down easily. The same with the hearty breakfasts and ubiquitous eggs. And where else can I get smoked salmon on scrambled eggs on a regular basis? Since food seems to be a central theme here, I can't leave out another local favorite – scones. With breakfast already behind us, we've been seeking out coffee shops or cafes for our breaks. I immediately case the front counter for scones. My cycling appetite often allows for jam and clotted cream as well. Might as well do it right. I don't know if I ever saw Rich's Grandpa Fraser in his kilt. But I certainly saw pictures, and knew how proud he was of his heritage. And after all, we were wearing a patch of Fraser plaid on our Tartan Tour jerseys. So it seemed a serious omission to bypass Fraserburgh on our first circuit along the north coast. Now it was time to rectify that. Scotland is famous for its changeable weather. 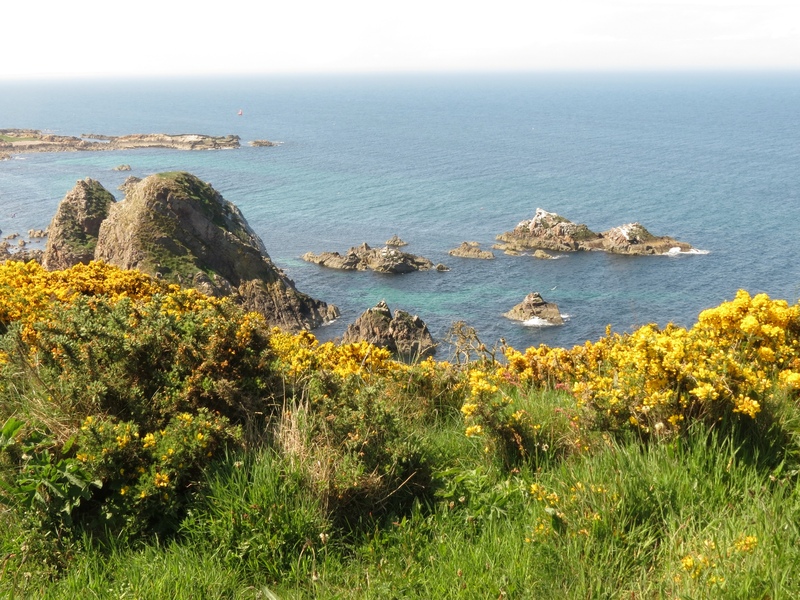 As we headed for Fraserburgh the warm sun of recent days was just a memory as we entered a world of fog. The vistas were gone, but in exchange we had peaceful rural scenery. Leaving the cycle route to continue east along the coast, we hadn't thought to check out the terrain. When the headlands reached into the clouds, we began to worry. Sure enough, more leg work was in store! Even I didn't think I could manage the steep grade, but it was mercifully short. With a heavy dose of determination along with ample huffing and puffing I reached the top. 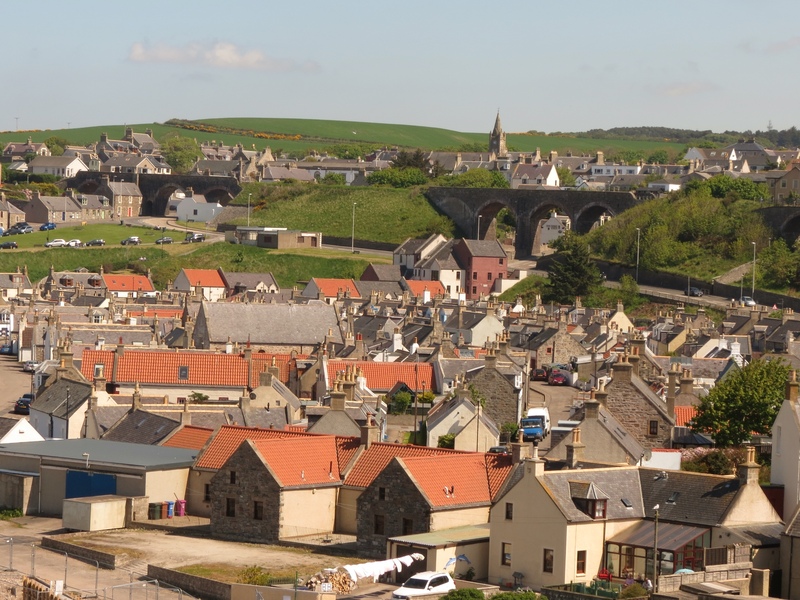 With some slack in our itinerary and to give our bodies their first rest day, we decided to spend an extra day in Fraserburgh. I'll be honest and admit it wasn't the most picturesque or vibrant place in my book. But sitting out a day of strong winds, mist and damp weather did have its advantages. 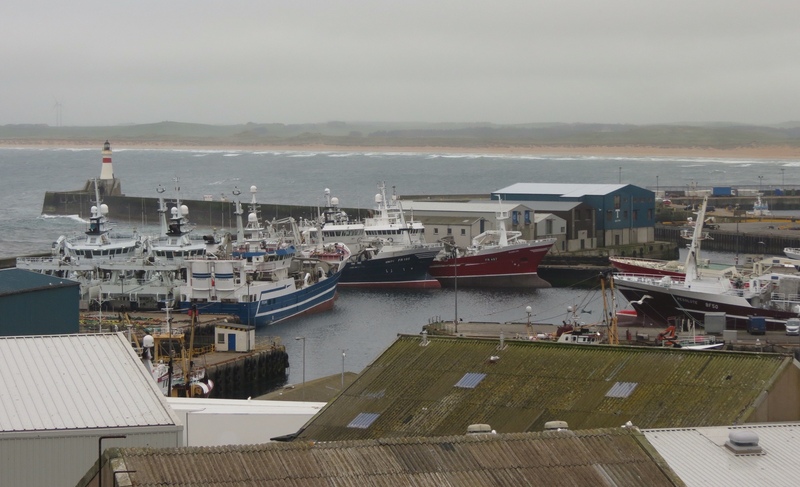 The best feature in Fraserburgh is the Museum of Scottish Lighthouses. We easily managed to spend three hours there, and learned a lot about the hard life of the keepers on the remote islands and rock lighthouses. 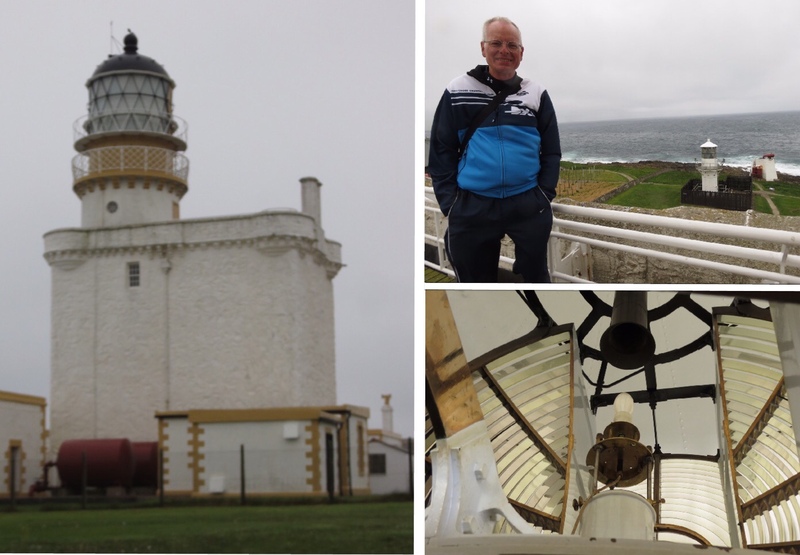 Our admission included a tour of the adjacent Kinnaird Head Lighthouse with an extremely knowledgeable guide. It was the first lighthouse built on Scotland's mainland, erected right on top of the castle built by none other than the Frasers. A later renovation included a full lighthouse tower that rose up through the castle's great hall. Because the lighthouse was ultimately replaced by a new fully automated lighthouse, the works for the original light were left entirely in tact. We got to see it in operation, and appreciate the precision timing required for the light's unique signal. 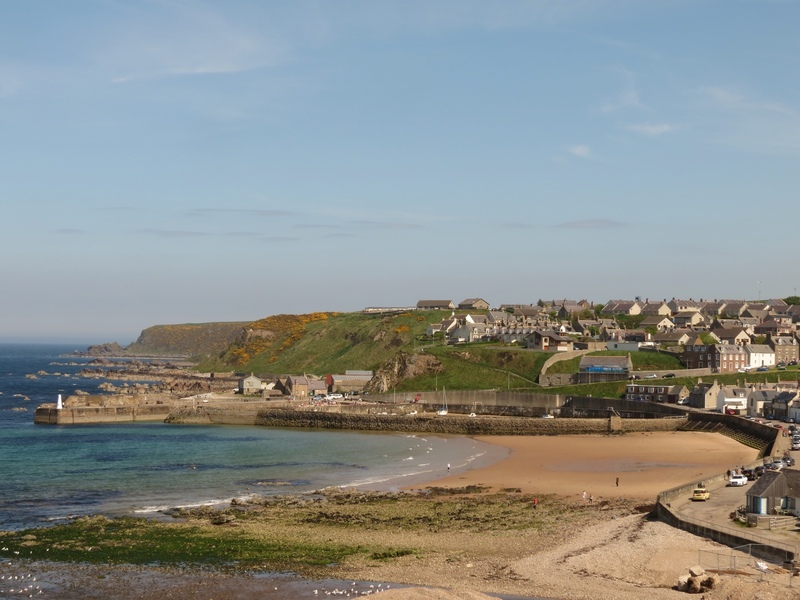 Fraserburgh does have a fantastic beach, and is a a favorite for surfers. It didn't show off particularly well on a cloudy day, but I enjoyed watching a couple of hearty surfers attempt the waves. The harbor was full of fascinating and colorful boats. Unfortunately the commercial nature of the area prevented me from getting much more than a glimpse of these craft. After a day of sluffing, I was more than ready to return to my bike. 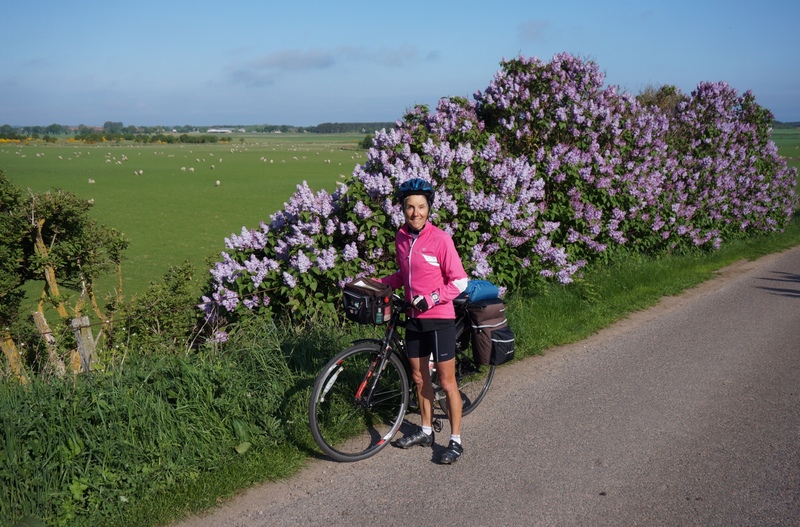 The continuing North wind finally benefitted us, blowing us across the flatter farmland to bring us back to Aberdeen. My favorite part of the journey was seeing the wind blow across the long grasses, creating moving shapes in waves across the field. They were bittersweet miles for me, knowing our tour was coming to an end. The capstone of our Fraser tribute was to be a day trip to Fraser Castle. At only 15 miles away and sans gear, it should have been a breeze. Instead, it was an exercise in futility. While the fierce winds were aggravating, it was the heavy traffic, construction and dangerous roads that ultimately caused us to turn back. Despite a bit of friction over the decision, we managed to make peace and agree to spend the day exploring Aberdeen instead. 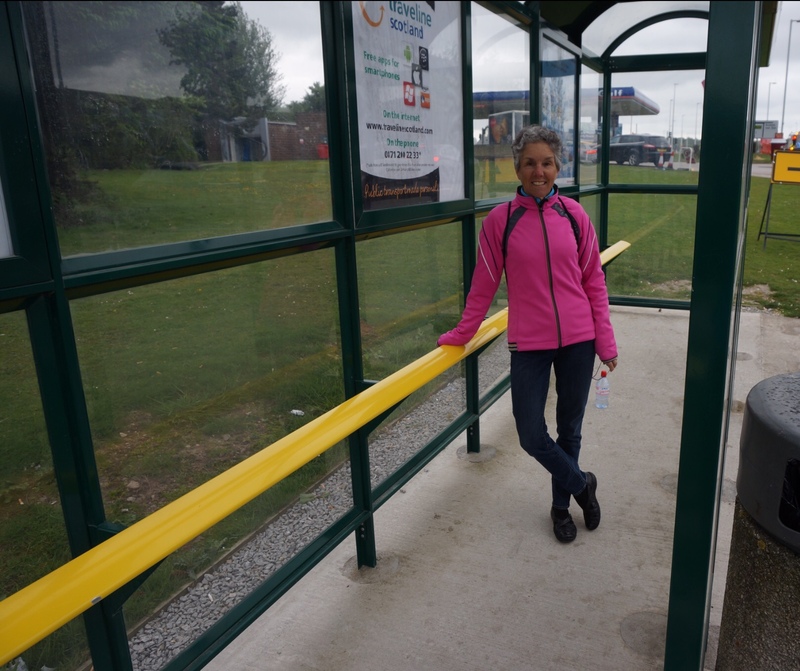 And I finally got to use a bus shelter for its intended purpose! 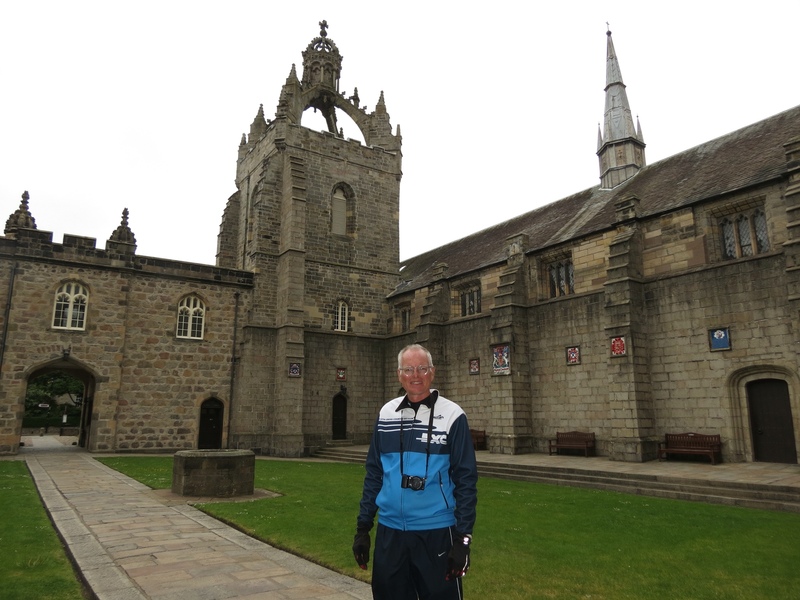 We were unimpressed with Aberdeen's busy City Center, but thankfully the information center equipped us with a walking tour of Old Aberdeen. There we found peaceful streets, wonderful old buildings, thriving university life and a great campus hangout called Grub for a snack and warm-up. Oh, and those crescents on top of these Turkish style gates at Powis House? Turns out they are the emblem of the Fraser family, who owned this estate before the gates were built. I guess it was a Fraser finish after all. Having reached Inverness, the most sensible return route to Aberdeen was back the way we came. While I would have preferred to find new ground to cover, things do look different coming the other way and we found plenty of ways to mix it up a bit. For starters, this time we stopped overnight in Inverness. Arriving late, we hurried out to find a place for dinner and stumbled onto Hootananny, which is a Ceilidh bar with live music. Since a large round table was the only one available, we were soon joined by three young people from London. We hadn't expected to be there long enough for the music to start, but between a delay in getting our food and great conversation with our table mates we did in fact hear some of the music. By that time, the place was packed. We certainly found local color. 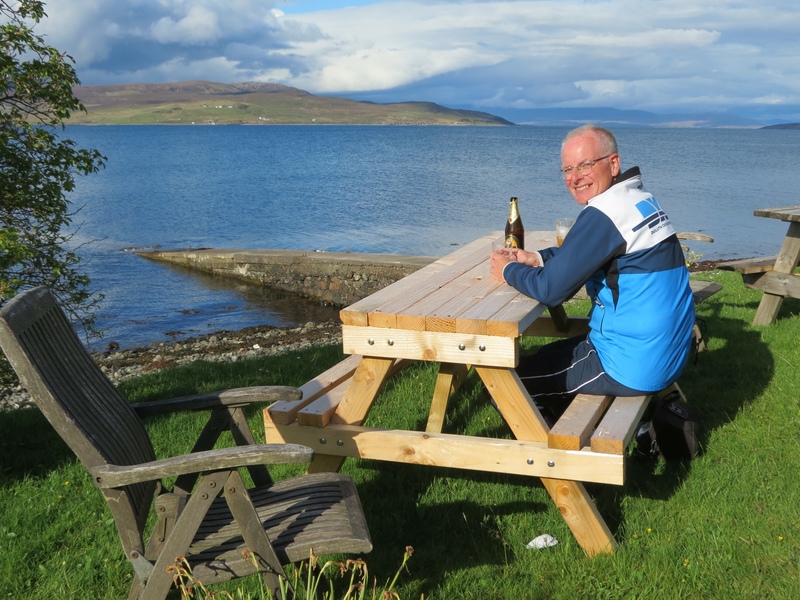 On our first trip across the northern coast, the weather was cool with a mix of sun and clouds, and windy. This time it was uncharacteristically warm and sunny with light winds. Our tights and heavy jackets were stashed deep in our panniers, and I even nixed the wool socks. 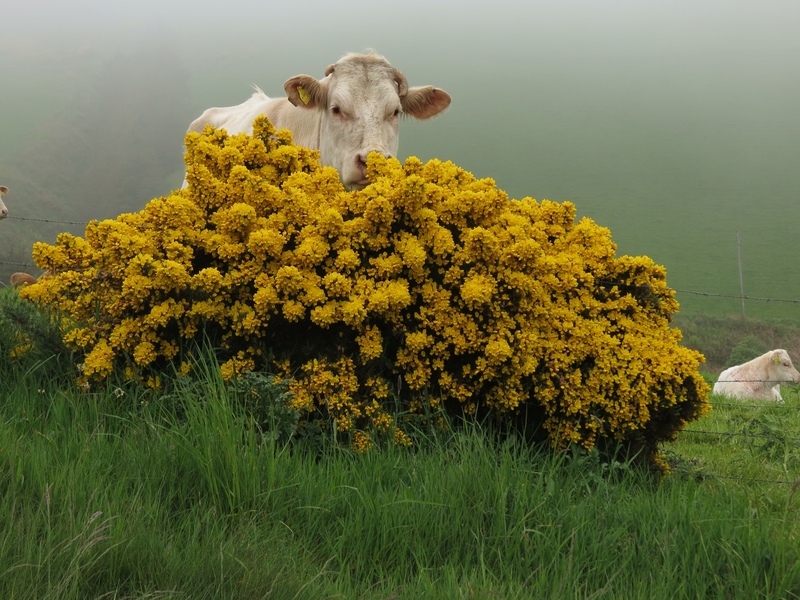 While the daffodils and tulips were finished, the gorse bushes were still brilliant yellow, and lilacs were now blooming as well. Retracing our route gave us a chance for some re-dos. Findhorn was recommended to us en route, and I almost suggested a spontaneous detour. But I didn't, and rather regretted it. We fixed that this time with a stopover in the little town on a bay. The warm weekend day brought everyone out to the water where there were sailboats racing, folks rowing a wide skiff, and even a water skier. Quality time spent on a park bench was a must. Repeating means getting to do favorite bits again. 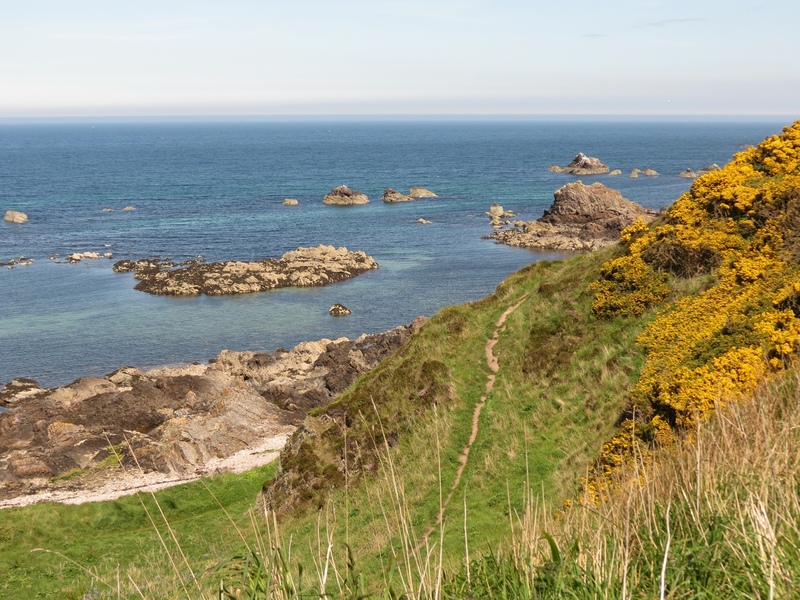 The path on top of the cliffs was a standout for me, particularly the last 6 miles approaching Cullen. And crossing atop the old via duct to reach the town was a classic. This time it was the perfect day to avail ourselves of the fabled Cullen Ice Cream Shop. We knew we had the right place. There was a long line out the door. Rich was eager to have another pub meal at the King's Arms. I was concerned it would not live up to our first warm and jovial experience there, but I need not have worried. The sequel was every bit as good. Nearly three weeks have passed since we first covered this ground. It seems inconceivable that we saw some of this on only our second day of touring Scotland. We have so much more behind us by this point. No wonder it's the same but looks so different to us now. It's a time honored battle. Rich wants to take it easy. I want to press on for more miles. I've made peace with our reduced mileage this trip, so it surprised me when Rich planned to cycle through the Great Glen in two days. The total distance looked to be about 110 miles. By car. It's always more on the cycle route. We've learned on previous trips that the best way through the mountains is to follow water. Stay in the valley to avoid hills. 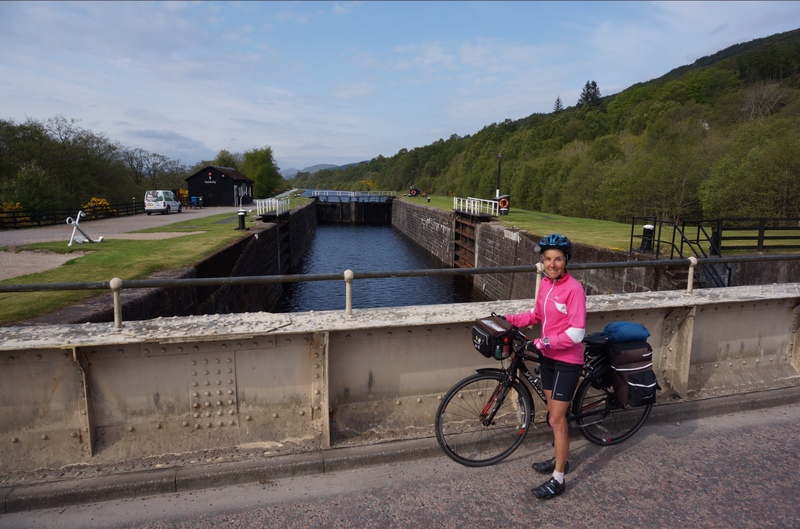 Since the Great Glen route follows a series of lochs and canals from Oban to Inverness, we figured it would be reasonably flat cycling. It was. For the most part. But as we'd been warned, there was one major climb. When you factor in three ferries, additional cycling miles, a big climb and some strong headwinds, we got more than we bargained for. They were the two longest days of cycling on our whole trip. And yet, there were plenty of compensating benefits. We always enjoy riding along water. This was unique in that we followed a series of inland waterways for 123 miles. The initial portion along Loch Lonnhe still felt like sea coast. And it had sights to go with it. We almost missed Castle Stalker, a sea castle just offshore from our cycle path. Good thIng Rich looked left and noticed it! There has been a castle on this site since 1320, and this structure dates back to 1450. A series of canals connect the lochs in the Great Glen. And with canals come another kind of locks. 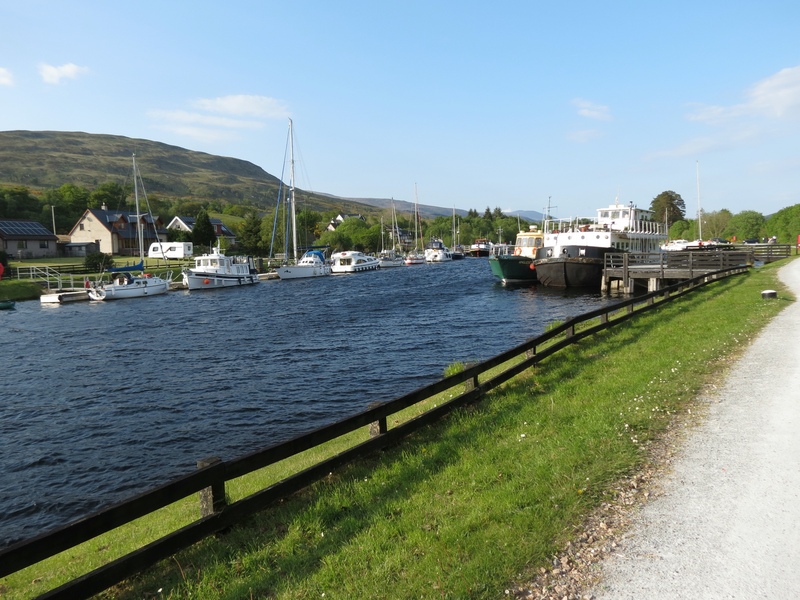 The first we came to was on the Caledonian Canal just north of Fort William. Called Neptune's Staircase, it is a series of eight locks and is the longest staircase lock in Britain. It lifts or lowers boats 64 feet. It was well past dinner time when we cycled by, so there was no lingering to take pictures. But I did snap a quick one of the boats just above the first lock. Other locks were simpler affairs, but no less interesting. We never got to see a boat going through, but one lock operator did ask if we'd like a cup of tea! I still regret that we didn't take him up on the offer. I'm certain he had some great stories to tell. For Rich, the main attraction was getting to see Loch Ness. 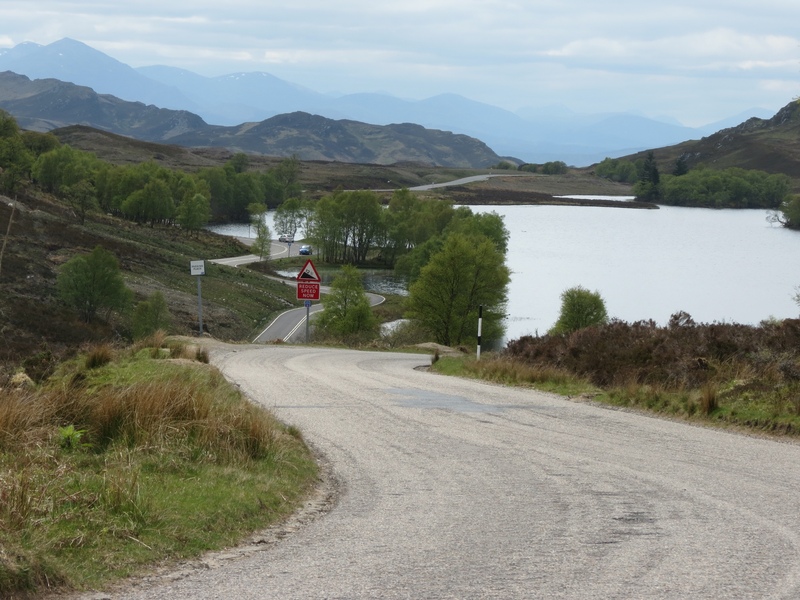 It was the final loch in this stretch and at 23 miles long there was plenty of time to look for Nessie. 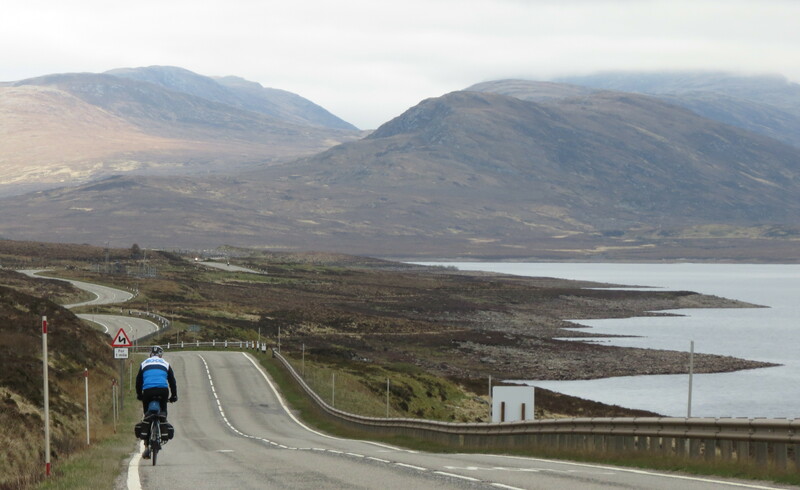 We traveled up the eastern side of the loch, avoiding the busy highway on the opposite side. We knew that initially the road veered inland, which meant navigating the steep hillsides. 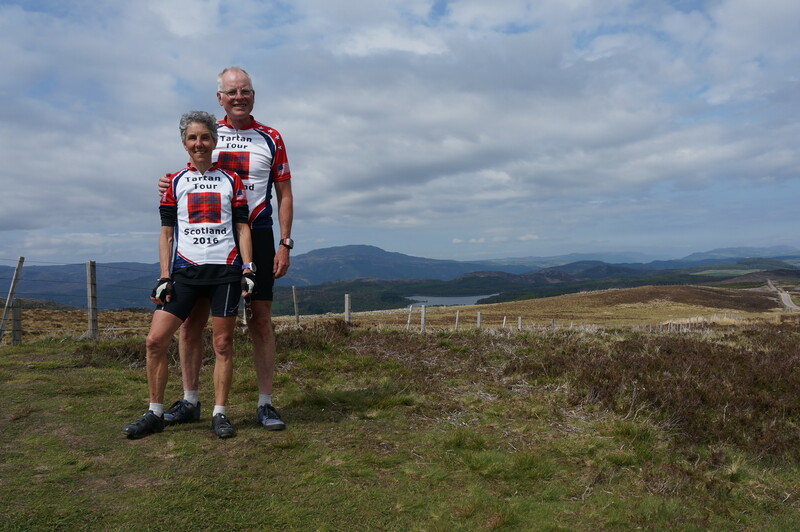 It was as long and challenging as promised, and by the time we reached the high point we discovered that we were several mountain ridges away from the Great Glen. 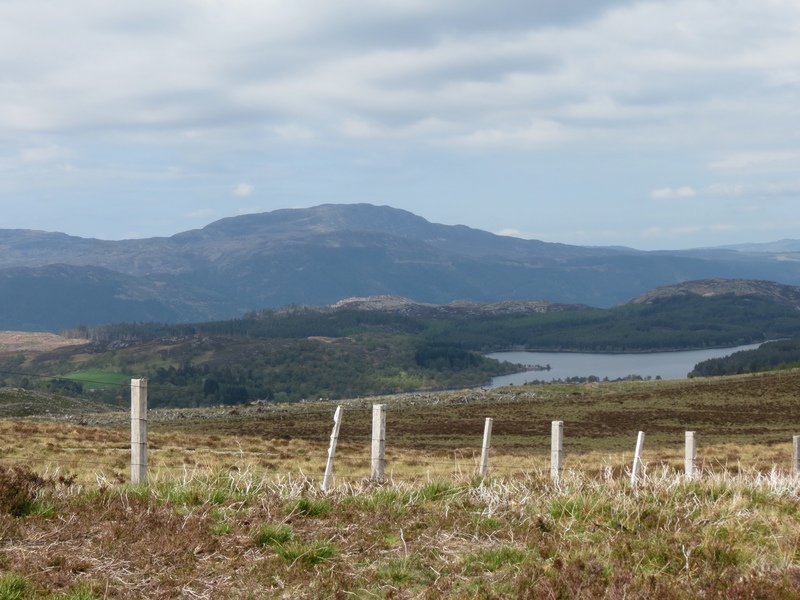 It seemed odd that the lochs we could see from there did not include Loch Ness. The journey back down eventually returned to Loch Ness and took us to the water's edge. 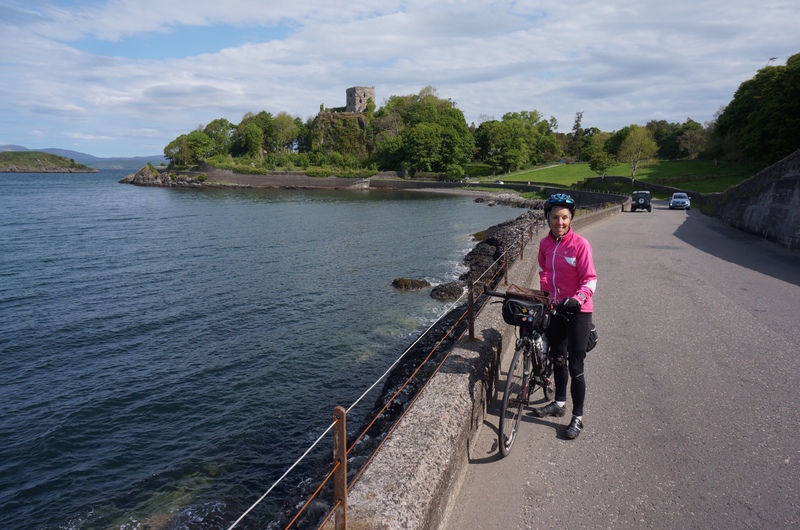 We appreciated the flatter terrain and could see the famous Urquart Castle on the opposite shore. By that time, after two long days we were even more glad to reach Inverness. In hindsight, it would have been wiser to take three days. But I have to say that I enjoyed the challenge. 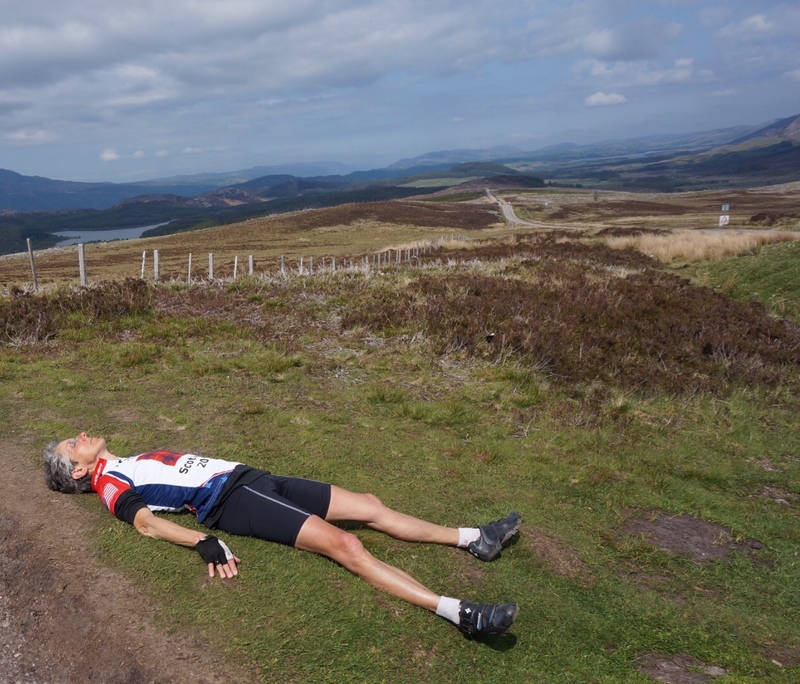 I relished each climb I completed, each mile I put behind me. I certainly got my exercise in the Great Glen. And even I got tired. We had plenty of good advice. That is the greatest benefit of staying with Warm Showers hosts. They know the area and can provide us with tips for our route. In this case, Mally had covered the same ground just last year, and we poured over her maps together and covered the logistics. The day started with a ferry that returned us to the mainland at Oban. 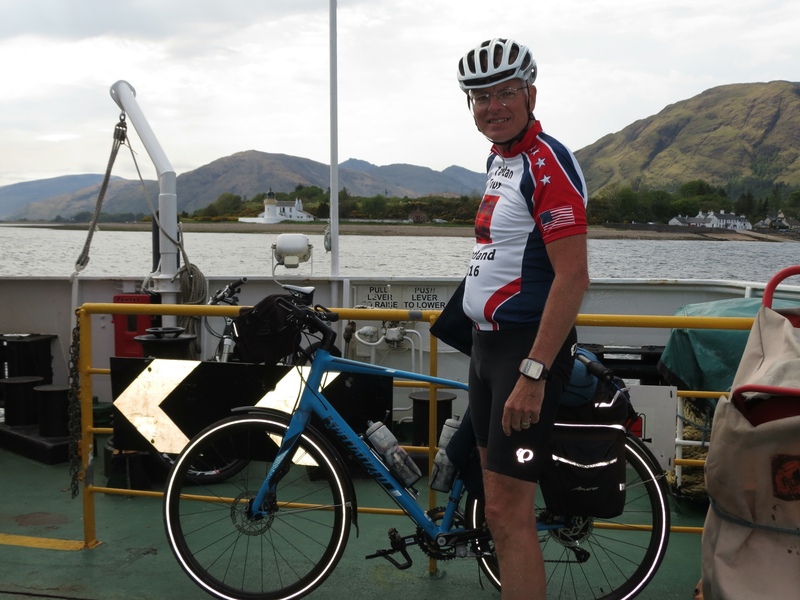 We had thought it would be our last ferry, but with Mally's insights we learned that the cycle route north entailed two short ferries across Loch Linnhe just below Fort William to cycle a 12 mile stretch on the other side, avoiding a treacherous stretch of highway. That was worth knowing. The first was a small car ferry at Corran. The boat was loading as we approached and we cycled right on board, congratulating ourselves on the perfect timing. There was a bit of a delay as we waited for it to fill, then it was a short hop over to the other side. Soon we were off cycling again, right along the shore of the loch. The next ferry was a passenger-only boat that also takes bicycles. I'd gotten a few of the ferry times from Mally, and knew that they were infrequent. There was one at 4:35 and instinctively I sensed we needed to make that one. Taking the lead I pressed on, pushing the pace, pulling Rich along with me. The going was easy and we were making good time. I began to breath more easily as we came within a few miles of the ferry landing. Then it happened. I saw the rock, tried to dodge it and failed. As soon as I ran over it I heard the back tire blow and it went flat instantly. In the local lingo, I had a puncture. So much for making that ferry. Rich made quick work of changing it, but by the time we reached the dock we could see the ferry approaching the opposite shore already. For this small operation, there was nothing more than a dock, a bus shelter and a sign post. Searching out the schedule, I was stunned to see that the 4:35 was the last ferry. This was worse than I thought. 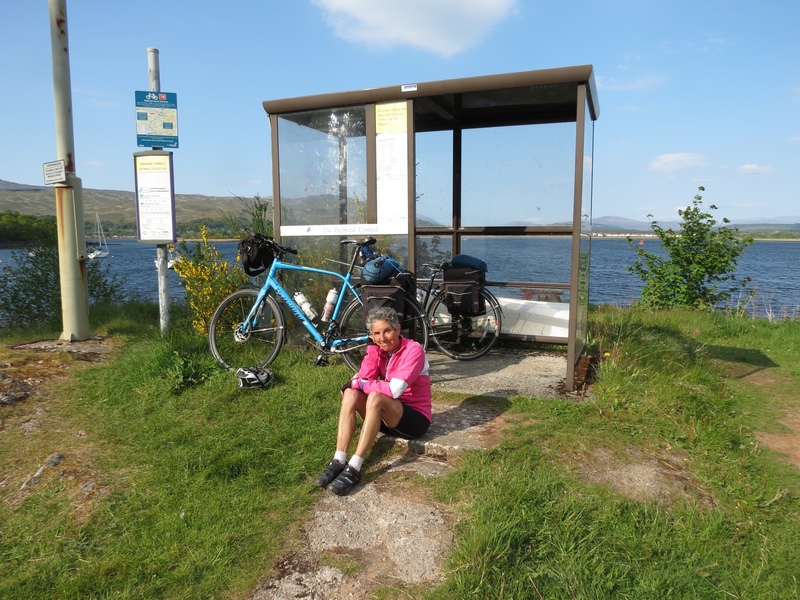 However, Mally had told me that cyclists could call for the ferry and had even supplied me with the operator's phone number. With a bit of skepticism, I dialed the number. My heart began racing when I reached voicemail twice. But on the third try I got through. Indeed, he said they would come in about an hour. We thanked our lucky stars that the weather was good and the days long. Even after the 10-minute crossing to Fort William, we still had 12 miles to go. It was well past 8:00pm by the time we got to our B&B that night. But it could have been a whole lot worse. If it really had been the last ferry. Forty years ago I visited Scotland with my older sister, Betsy, and a friend. We hired a car, but only Betsy was old enough to drive it. That little red car took us all over the countryside. We had a very detailed map which was excellent. However, it was so large we had to exit the car in order to unfold and refold it to the section we needed. What I remember most are the ubiquitous single-track roads. Narrow lanes with passing places. Harrowing encounters when other cars approached. 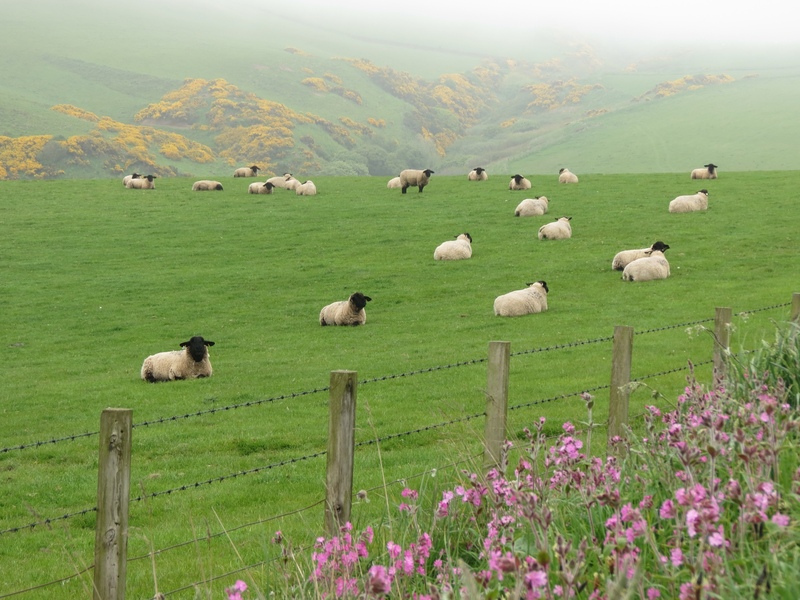 And sheep encroaching on the road. That map has since been replaced by Google Maps and a cell phone. 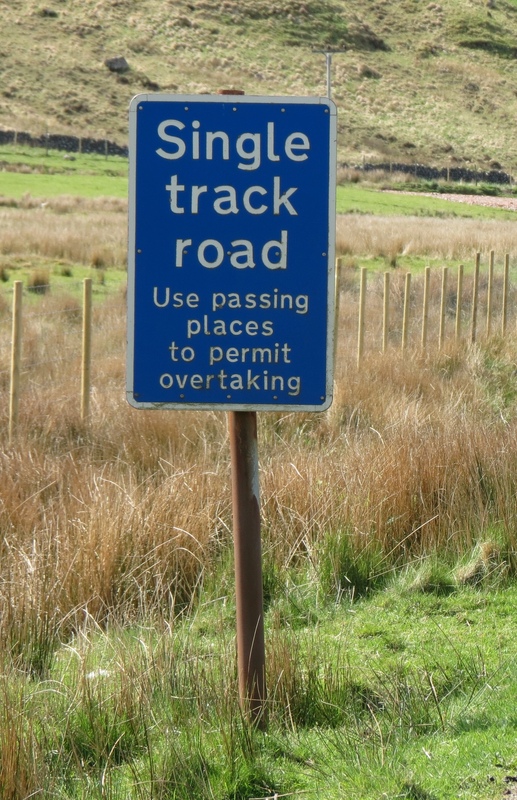 But the single-track roads remain. Little did I know I would return many years later to cycled down those very roads. 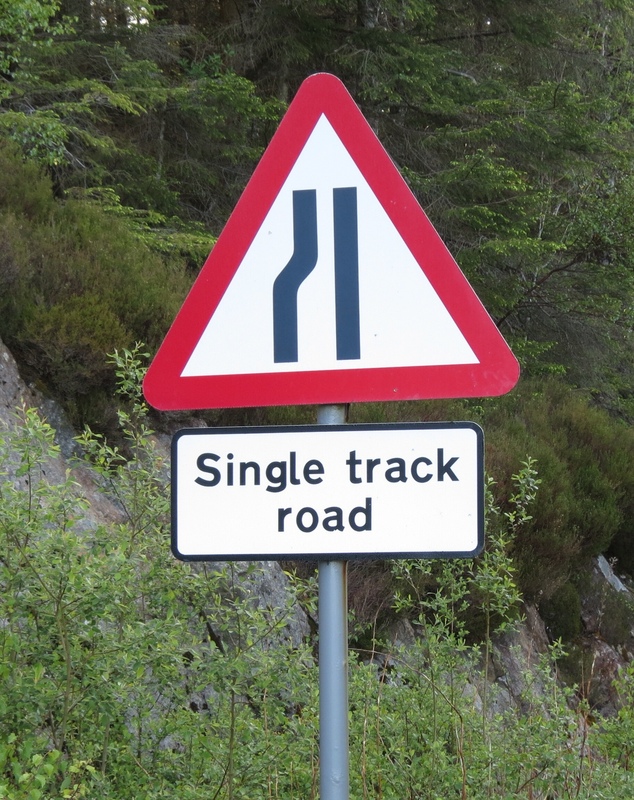 The Isle of Mull has only two short stretches of two lane roads. All the rest are single-track. The narrow bit leading into Tobermory is particularly steep, with switchbacks to take the traffic up and over the headland. It was in that section that the single-track roads ceased to be quaint. We made halting progress as we were continually sidelined in the passing places, waiting for large vehicles to pass. 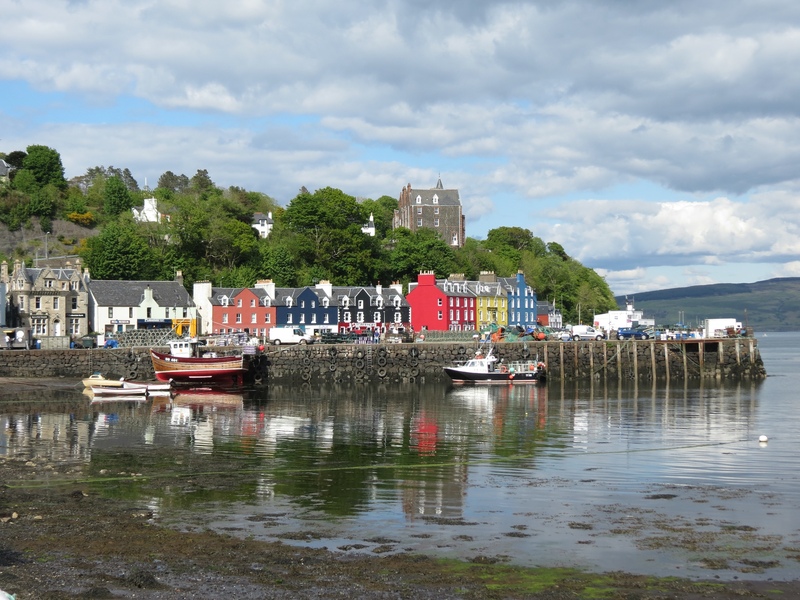 But Tobermory was worth it. We arrived late in the afternoon, with the sun at the perfect angle to light up the vividly colored buildings surrounding the harbor. Sailboats and fishing craft bobbed in the calm water and visitors strolled among the shops and restaurants. 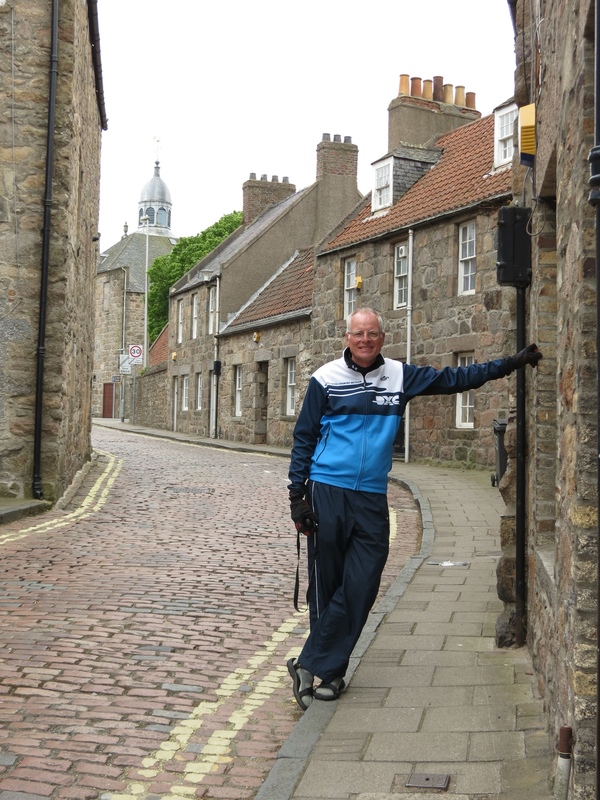 We had booked into the Scottish Youth Hostel, which unlike some of the more posh lodgings was located right on the harbor. In fact, it's the salmon colored building in the picture. With dinner just a few paces away overlooking the waterfront it was prime accommodation in our books. A leisurely morning took us back along the northern side of Mull. The day before, I had eyed the Coffee Pot as we passed and stopped to inquire what time it opened. When the shop owner learned we would be returning before her opening hour, she invited us to knock on the door and offered to serve us early while she was baking. 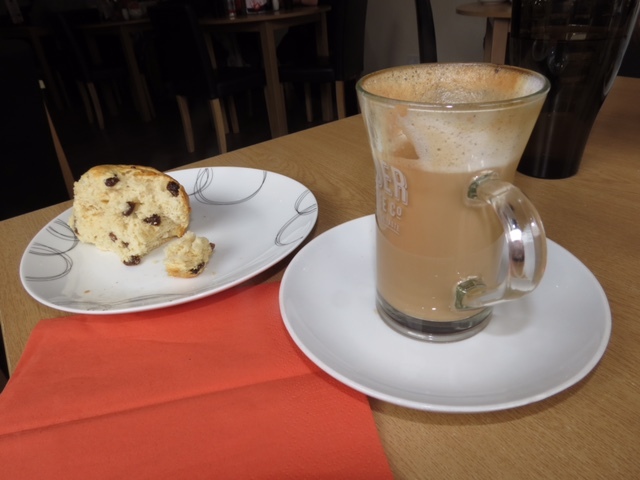 True to her word, we were able to enjoy her fresh baked scones and a latte, and even a Diet Coke for Rich, in the warm morning sun. Her gracious customer service was not without consequences. Our presence flagged the coffee shop as “open” and other customers soon flooded in. Fortunately she was good natured about it, knowing that would happen. 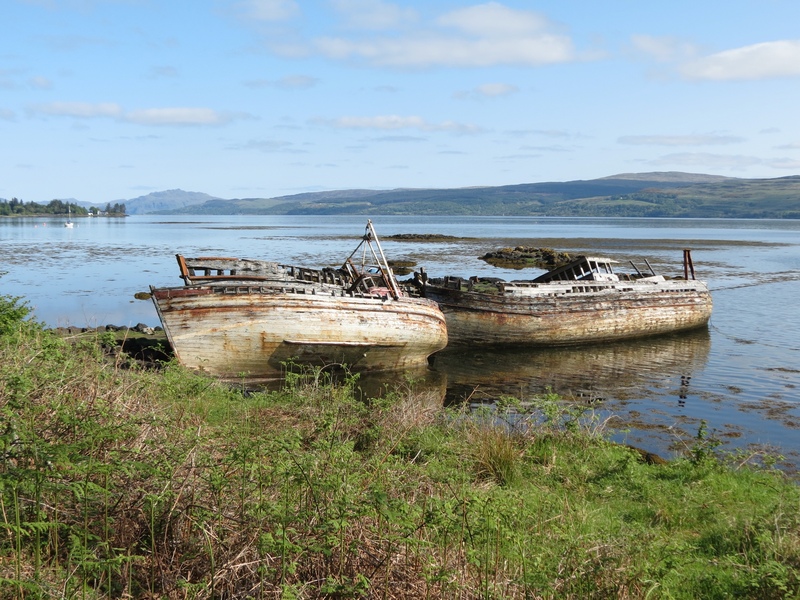 A trio of old boats resting on the shore begged a photo. They've been there over 40 years we later learned, one of them a “puffer” which transported goods and services to the islands. Our final stretch of single-track road took us on a quiet lane outside Craignure, right to the door of our Warm Showers hosts for the night. We laughed over the introductions, with Mally and Richard hosting Molly and Rich. We didn't have to Mull that over. We knew we'd like these people.